The Cisco Toronto 2015 Countdown Clock. It was almost one year ago today that Jeff Seifert stood next to a giant, colourful, and connected clock in Toronto’s Nathan Philips Square. 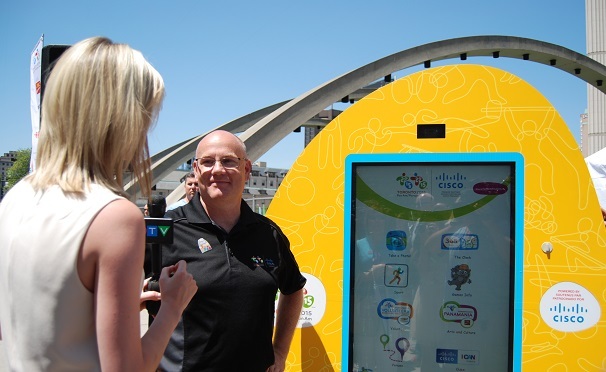 The chief technology officer of Cisco Canada posed for photos and conducted interviews with broadcasters alongside the technological obelisk as it started to tick down to the start of the Pan Am and Para-Pan Am Games, hosted by Toronto beginning July 10. The event, which claims to be the third-largest amateur sports event ever and larger in scope than the Vancouver Olympics, features Cisco as a title sponsor. The vendor of networking communications technology plans to use the opportunity to showcase the power of the “Internet of Everything,” a term that it uses to describe the trend of connected devices and the resulting sea of data generated by them. Even the clock is connected via high-capacity fibre, and offers information kiosk capabilities as a result. A year ago, Seifert even hinted it would facilitate video chats between athletes and pedestrians. Jeff Seifert, chief technology officer for Cisco Canada, next to the interactive kiosk in Nathan Phillips Square one year ago. Behind the scenes, Cisco is running the network for the various games venues that stretch across southwestern Ontario. Seifert anticipates a huge demand on the networks during the events. With 17 days left on the countdown clock, he’s talking about the importance that it all work when the games are on. Working with Seifert and Cisco is Brian Cook, vice-president of IT for the TO2015 Pan Am and Parapan Am Games. A veteran of major live sporting events including the 2012 London Olympics and past Pan Am Games, Cook is ready to turn the key on firing up a huge IT operation for the duration of the event. Deploying wireless networks, radio coverage, boosting cell coverage, and installing computer systems are all part and parcel of the requirements. The budget isn’t exactly generous. Cook’s team has $77 million to work with – compare that to about $1 billion for the London Olympics – so it will be looking to lean on Cisco’s sponsorship to be as effective as possible. Cisco has tapped its network of partners to assist with the effort and has even tapped its Cisco Networking Academy to chip in. That educational initiative will see college and high school students assigned to working at different venues, supported by a mentor from Cisco. “Many of them have actually graduated and are taking time from their full-time careers to do this for the summer,” Seifert says. 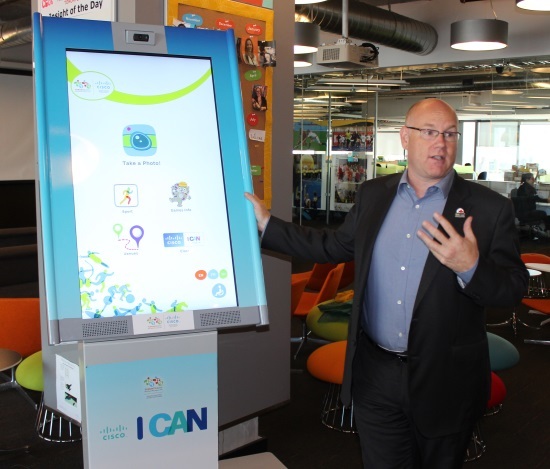 Just 17 days before the start of the Pan Am Games, Seifert shows off an interactive kiosk. Serving as the base for the games’ technology infrastructure is a network linking the Athlete’s Village, airport, International Broadcast Centre, Main Press Centre, Distribution Centre, sporting venues, and even healthcare facilities. The backbone is Beanfield Metroconnect’s 10 GBps core network that is run on dark fibre throughout the downtown core, supplemented by L2/L3 level services for regional events. Internet connectivity is being supplied by both Beanfield Metroconnect and Allstream. Even in-venue Wi-Fi for fans will be resilient. Cisco ecosystem partner AmpThink providing the wireless network – the same company that provides it for the Superbowl. (Of course, not every event will have the benefit of Wi-Fi – the sprawling mountain biking route in Minden, Ont. is out, for example). Fans will be able to use those Wi-Fi networks not only to post their selfies to social media, but to interact with different elements of the stadium. By working with systems integrator Atos, Cisco has prepared a network-connected scoreboard at the Milton Velodrome. Through the more than 70 access points in the bowl area of the cycling venue, fans will be able to participate in the social media streams related to the event, and then see their content displayed on the scoreboard above the track. There’s a litany of other technological baubles Cisco can hold out during the games. Telepresence units linking various venues will serve to connect media with athletes for interviews, allow fans to ask a question of an expert on duty, and allow physicians to consult with athletes that may have suffered an injury or fallen ill. Interactive kiosks placed throughout the games area will serve as wayfinding stations and infotainment units. Athletes will connect wearable devices to wireless networks to monitor their performance and store it for later analysis. It’s all a part of Cisco’s vision to highlight its capability as a premiere provider of sporting venue technology solutions, says Chris White, senior vice-president of global sales for Cisco’s Internet of Everything division. In other words, Cisco is picky about where it sponsors these events. The vendor is a sponsor at the upcoming Rio Olympic Games as well, but White wants to see more scenarios where Cisco is being paid to build up infrastructure to support major sports entertainment, instead of providing the sponsorship. White recalls that a few years ago, when instant replay was being introduced as a way to resolve close calls in Major League Baseball, Cisco was chastised for bringing technology into pro sports. But now it seems like a natural fit. The culture has shifted. Still, Seifert stresses that technology use at the Pan Am Games is designed to augment the spectator experience, not take away from it. “The concept is that you learning about the sport while you’re watching it,” he says. The big Internet of Things clock hits zero, then starts counting up on July 10. Let the games – and the learning – begin.